OSWEGO, NY – The Oswego Fire Department and Domino’s are teaming up again this year to help save lives, one pizza delivery at a time. 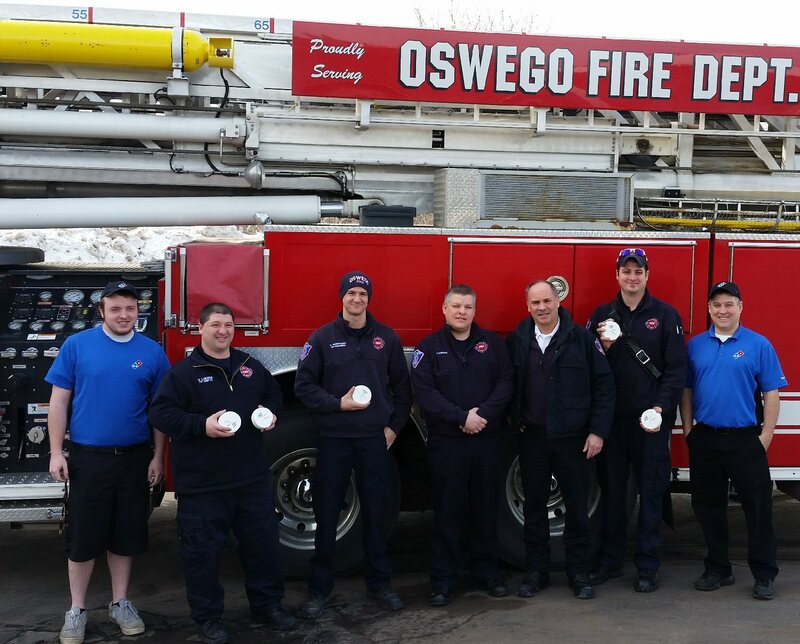 Customers ordering pizza delivery from the Oswego Domino’s during the month of March may see a firetruck and firefighters helping to deliver an important safety message along with their pizza – Smoke Alarms Save Lives! Oswego Firefighters with representatives from Domino’s display smoke alarms. Participating customers may even get their pizza for free. Firefighters will accompany the Domino’s delivery driver on select visits, and check the home for working smoke alarms. If the home is properly protected with working smoke alarms, Domino’s will reward the customer by giving them their order for free. Firefighters will replace batteries and install new smoke alarms if necessary during the home visit. This is all part of a national fire safety campaign that Domino’s and the National Fire Protection Association have teamed up for, with the goal of saving lives and educating the public about the importance of working smoke alarms. According to the NFPA, roughly two-thirds of home fire deaths occur in homes without working smoke alarms. On average, seven people die every day in U.S. home fires. Chief McCrobie reminds Oswego residents that smoke alarm batteries should have been changed last Sunday along with the clocks for daylight savings time. Residents are reminded that smoke alarms should be installed inside every bedroom, outside of every sleeping area, and on every level of the home, including the basement. Carbon Monoxide alarms should also be installed on every level of the home. All alarms should be tested monthly and replaced as needed. Most alarms are good for 10 years. Residents with questions can call the Oswego Fire Department headquarters at (315) 343-2161.